I love running (and lycra) but my first love with always be food. From zesty summer quinoa salads to juicy bacon cheeseburgers, I love it all. 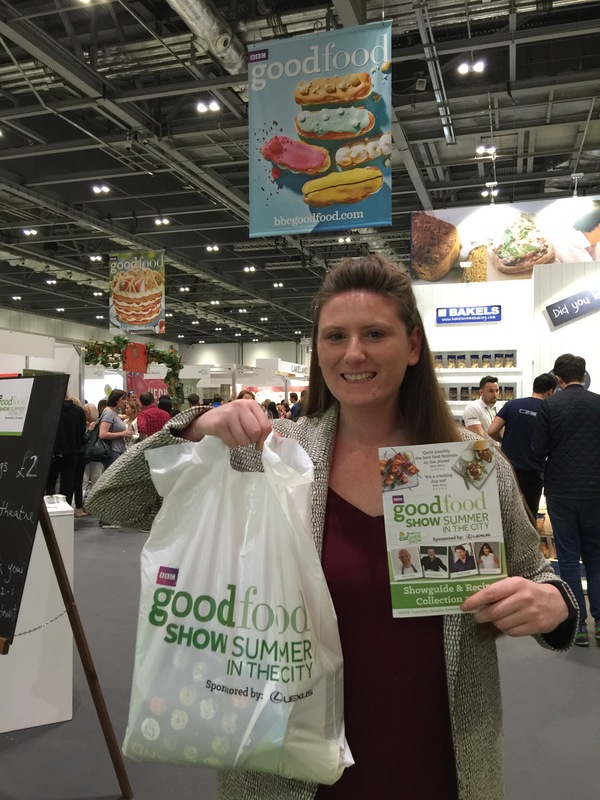 I was lucky to be given two tickets by The Health Bloggers Community to attend the BBC Good Food Show this weekend. Alex is an even bigger foodie than me so there was no persuading needed. This weekend was the ‘Summer in the City’ Show, held at the ExCel centre in East London, which is ideal for transportation links. We arrived around 11am and the show was already buzzing with people. When you first arrive there is so much to see and take in it can be a little overwhelming by we grabbed a show guide and decided to snake our way from right to left. I was like a child in a sweet shop and had to keep myself from flitting from one stall to the next. 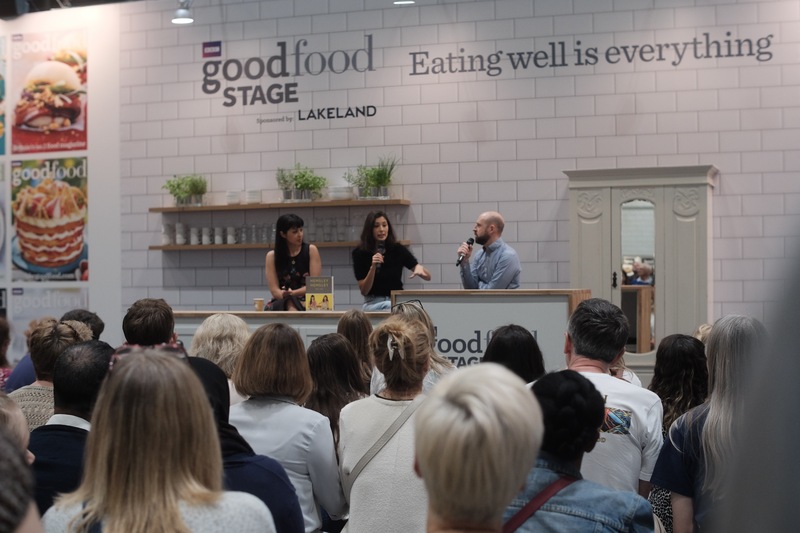 After an hour of sampling and talking to exhibitors we hadn’t even covered half the room but decided to take a break and head to the SuperTheatre to see the lovely Hemsley + Hemsley sisters in action. It was a giant theatre and we had been allocated tickets near to the back as we booked on the day. There was a big screen and they had microphones but I would recommend booking in advance to be closer to the front. Returning to the main room at 12:45pm we noticed a huge influx of people, making navigating our way around and getting close to any of the stall rather difficult and talking to the exhibitors near impossible. So I would highly recommend getting there as early as your can manage; doors opened at 9:30am. 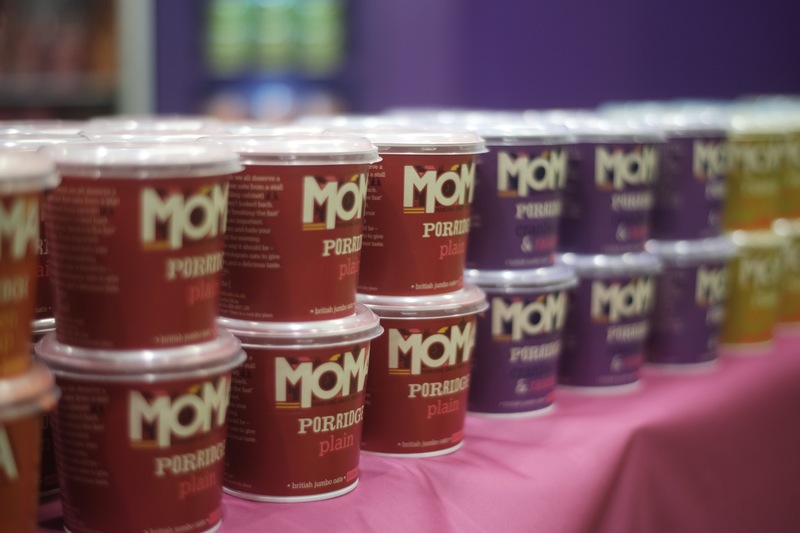 The exhibitors were divided up into an ‘Eat Well’ section which catered for my health conscience with the likes of Oppo, Momo, Vita Coco and Meridian Foods. 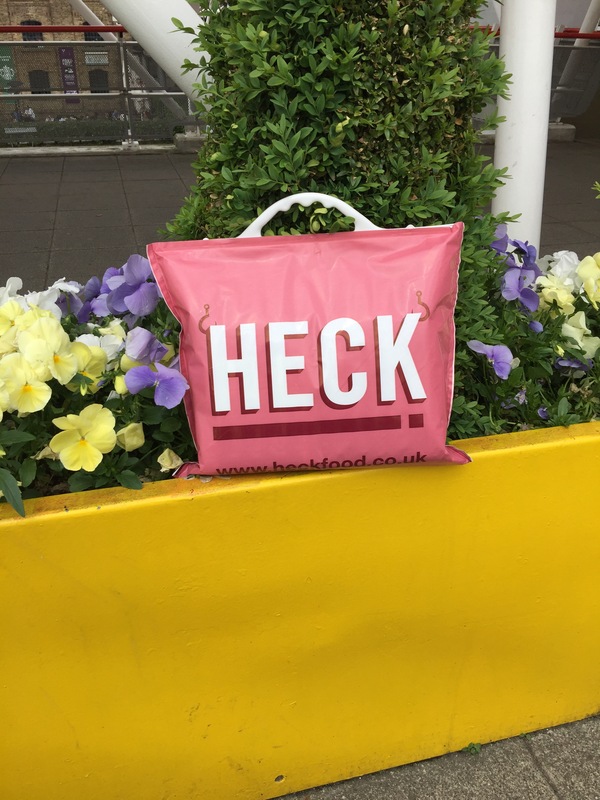 So cheekily I was able to ‘try out’ some of my solid favourites as well as discovering new brands of birch water, matcha and health bars. Can’t say I was sold on the Jimini’s dried insect snacks/bars but I’m willing to give most things a try once. 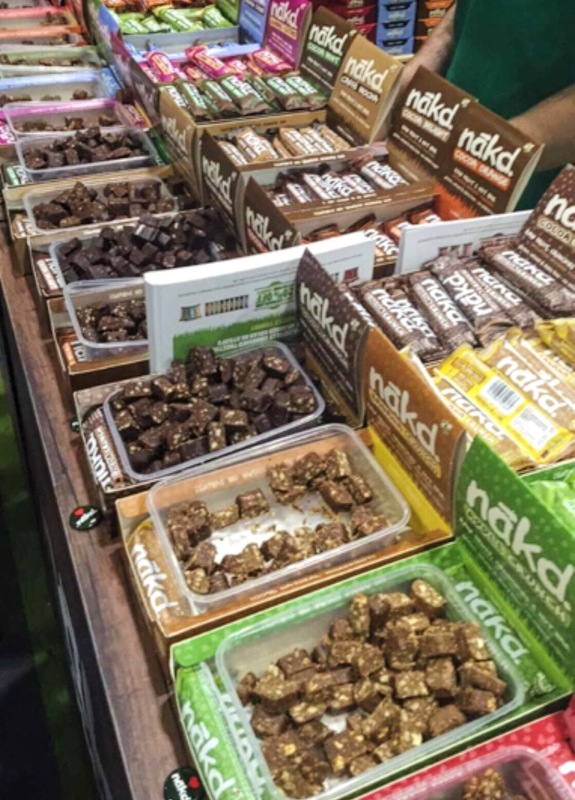 To my delight I discovered a new flavour of Nakd bar, Berry Blast, I had to resist the offer of 21 for £10 because the more I have around the more I gobble. Then for the treat/cheat/I’ve been on a long run / it’s the weekend occasions, we indulged in the Good Food Champions and Producers’ Village. Think good wine, delicious cheese and tasty charcuterie. We may have signed up to be part of the Naked Wines club. We were sold on it being more than just a wine club, they have an ethical philosphoy of supporting wine start ups and wine producers experiencing financial difficulties. Members are known as ‘Wine Angels’ and we will have our own wine advisor assigned. I might be some way off owning my own property but hey I now have a wine guy. The generous samples of wine we tasted didn’t influence us to sign up, promise! To leave on a healthy note we headed to the BBC Good Food Stageto listen to a talk on “Creating a healthy kitchen” with a nutritional therapist Kerry Torrens and Hemsley + Hemsley who emphasised my favourite philosophy of life in balance and having a diet of good wholesome homemade food rather than any silly fad diets; something I can get on board with. On the way out we collected our goodie bags which contained an interesting array of drinks, snacks, mayonnaise and slightly baffling, Ariel washing tablets; for when you spill your food down you? Tickets ranged between £20-28 for a day pass depending on which package you opt for. 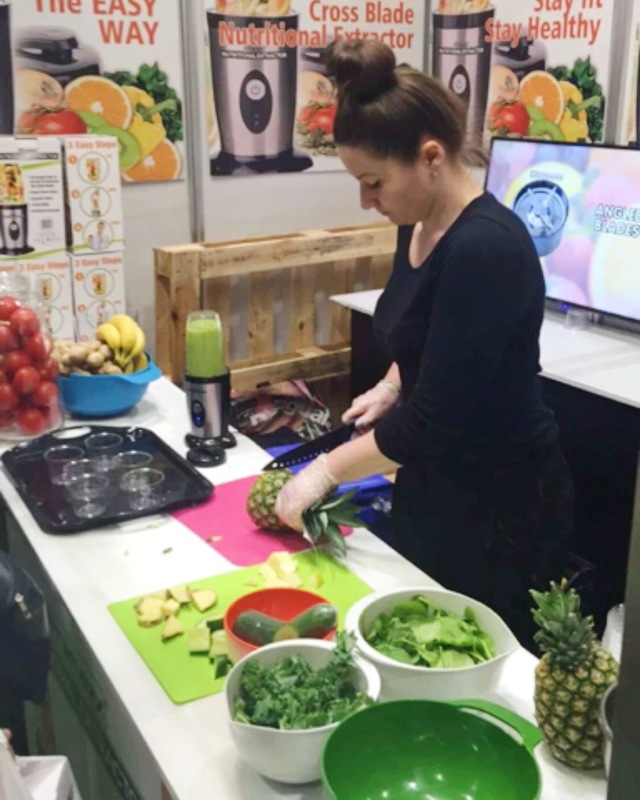 We were slightly divided on whether we felt the show was value for money, I certainly enjoyed the healthier products section more than Alex but we both would have liked to have seen more owner produce exhibitors, so I think it really depends on your budget and what you are looking for/ interested in. Biggest bug bear of the show, a small bottle of water cost £1.95 (there were no big bottles) and there weren’t any water fountains in sight. So my advise would be to bring a big bottle with you, particularly for between samples. Overall we had a really good day and came home to a delicious dinner of zesty chicken Heck sausages with potato salad made with some delicious Le Range Mesurier saffron and garlic mayonnaise purchased at the show. It might have been followed by Oppo ice cream topped with 72% raw cacao OM Bar that we also picked up. Last treat before heading into weekday healthy eating mode. 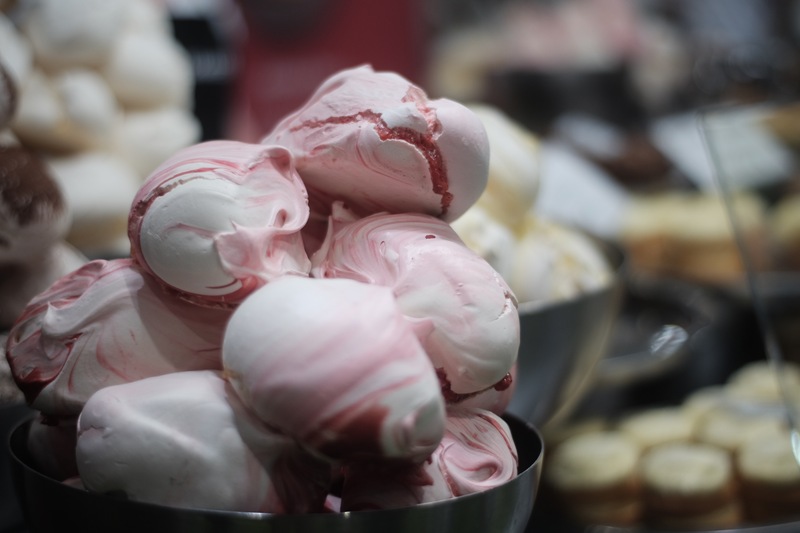 If it tickles your fancy then the next London show is being held from 27-29th August at Hampton Court Palace and a full listing of other shows around the country is available on the BBC Good Food Show website.